"I don't want to make this obtuse for you guys." He means "abstruse". He is obtuse. It's trying to use words like that that makes his class abstruse, anyway. In the immortal words of Mark, "My mama always said, 'Don't use a five-dollar word in a one-dollar conversation.'" It isn't really him. I'm not one to speak about malapropism, just see my somewhat dubious use of the word "officious" a couple entries back. I did wrestle over that one, I'll have you know, before I decided that was the closest I could get to what I wanted to say. I'm just so tired of this class. "If you were a triangle, you would be acute!" By the time I die, if someone hypothetically decides to make a movie about my life, I hope that the most appropriate soundtrack would be one composed by John Phillip Sousa. If he were hypothetically still alive. "Remember what we talked about-- please don't indicate that you can speak or that you can understand them, it's very important. Besides, it would terrify them, quite likely! What a scene!" The towel was walking two paces ahead, throwing words carelessly backwards at her charge. "Well there I go," continued the towel, "I'm chattering like a sheet! Let's go see who will clothe you for the time being. She bustled into the next room, where a dozen dresses were lounging over the backs of chairs and hanging aloofly from hangers that were precariously balanced on the top of a slightly ajar closet door. "Ladies," said the towel sharply. Nothing moved. "Ladies!!" With speed that belied her thickness and generous thread-count, she towel-whipped the nearest dress with a loud crack. There was a wail of dismay, particularly from the target of the snap, but the dresses slowly roused themselves from their chairs and hangers. She was slowly becoming more accustomed to talking and moving clothing, but it was still a wondrous sight to behold. So many dresses, each lovely and unique, ballooned from flat, lifeless cloth to full and splendid form as they gathered around Madame Towelle. How could something be made of such delicate fabric and still have enough strength to stand up straight? It was a silly question, as the same could be said for any but the starchiest of the clothes she had encountered so far. "Now," said Mme Towelle officiously, "Which of you would like to clothe this human being to the function tonight." "You had to choose the most awkward-looking human you could find." commented a slim, elegant -looking green dress sourly. Despite Mme Towelle's warning, her pleasant smile slipped a notch towards a frown. "Not me!" chimed in a short sun dress. "Its legs are much too long for my hem. I would look ridiculous!" "Now, now, you haven't even tried it on yet!" clucked the towel. "How about you, dear." The towel gesturing to a lovely peach frock with embroidered straps. She felt a twinge of excitement in her stomach. Perhaps she wouldn't mind dressing up in a silly dress after all if it were one like that! "You must be joking," the dress retorted, "I wouldn't be caught dead on that." This routine countined for a little while longer, much to her growing annoyance. According to the dresses, she was too thin, too tall, and too old-fashioned-looking. The few who volunteered to be tried on said that her skin color didn't match anything, that her bust failed to fill them out properly and she hunched her shoulders. One of them actually said that they might consider clothing her if something could be done for the "stupid-looking" expression on her face. She was getting a bit angry. After all, they were so picky-- it was a wonder they ever found anyone to wear them at all. Perhaps they would just prefer to be on their hangers all the time! Besides, it was THEY who were too loose and too short and too big around the bust. She wanted to shout out at them, to tell them that she could hear everything they were saying and that she appreciated none of it. What a surprise that would be for them indeed! She was about to throw in the towel, perhaps very literally, when a lovely blue satin frock glided in from the far side of the room with several plain grey dresses at its shoulders. "What is happening?" it asked in a pleasant voice, like a song. "Madame Towel wants one of us to clothe this ridiculous thing to the function tonight," said the emerald dress with a snort. "You should really put a wager on it, Mme, perhaps then you'll get some volunteers." The blue satin frock took her wrist in its gossamer sleeve and seemed to examine her. It raised her arm and twirled her around. "Why, it's not hideous after all." the dress said, almost to itself. It lifted her other arm and then settled itself over her head in a delicate movement, lacing itself up the back as it went. When her head appeared through the embroidered neck of the dress, she was astonished. A shimmering blue wrap that had accompanied the frock took down her hair from its rubber band and arranged it neatly around her shoulders before arranging itself around her shoulders as well. The dress fit her perfectly. Standing there in the mirror was an elegant young woman where a rough and tumble young girl had stood only a moment ago. Even the chattering dresses fell silent as the blue frock spun her around in front of the mirror and a million shattered bits of light reflected from its sparkles skittered about the room. It seemed as if no one knew what to say for a moment, until finally a coral-colored dress grumbled, "Some clothes can make anything look good." The room emptied rather quickly after that, until the last dress rustled out of the room and unhooked the empty hangers from the top of the closet door before firmly shutting it behind it. Only the blue dress, wrap, Mme Towelle, and the terrycloth robe she had been wearing remained. The robe had its cuff poised thoughtfully at its non-existent chin. "My,my," it said in its country drawl, "That does look awfully nice." I would write a real entry but I'm stealing time on my roommate's boyfriend's computer while they're asleep because my computer has a virus and the fan might be broken and the power cord frayed in half and I haven't gotten a new one yet but the computer ran out of battery power. Also my roommate's computer can't get the internet at the moment for some reason. And the cat is trying to sleep poor dear but she doesn't like the light. She's trying to put her whole head under her leg so the light won't shine in her eyes. Right now there are all these real human bones lying around in the living room because my roommate (Thalweg)'s boyfriend (g-bird) is in medical school. The bones have been sitting in this tackle box in the corner of the room for weeks and I guess they finally escaped. We apparently have a femur and half a pelvis and a coccyx on the coffee table. The rest haven't escaped from the tackle box yet. Good thing we don't have dogs. 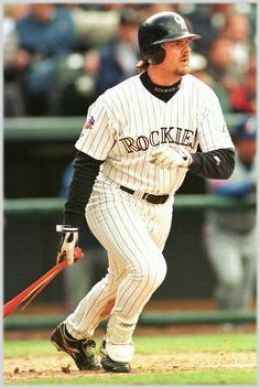 If only we still had Larry Walker. So I was totally overwhelmed by work the other day and I was making a list of things I had to do.... so... what better way to tackle your work than by wasting time writing a poem?! Eat! Eat! My stomach grumbles, Think of the meals you’ve missed! It anchors a fuzzy floating feeling with weights hung round my eyes. Plan! Plan! I must plan, I must organize my mind. But Work! Work! I first must work, for I’m already so behind. But Love is the one strong clear voice that neglect cannot subdue! And still I’ve not decided how I shall spend my time tonight. Because I'll probably be dead by then. Let's exchange "probably" with "hopefully". On the way home on the airplane I sat next to a man who seemed to have a lovely wife and horrific grandchildren. He had just finished a grand tour of Europe, including several cruises around the Baltic and the Mediterranean. He was an electrical engineer (well, he was before he retired, and he's been retired for a while). He graduated from UDubb, and then moved down to Arizona in 1965 because his wife had gotten a job there. She might have been his wife at the time but I'm not sure. She was sitting across the aisle because they both wanted aisle seats. He packed all his stuff in his car and drove down over a weekend, having no idea what he was going to do when he got there. On Monday he went and got an interview, interviewed that day, and went to his first day of work on Tuesday. The rest, as they say, is history.